Big Cash Win Classic Slot Guide & Review - Casino Answers! 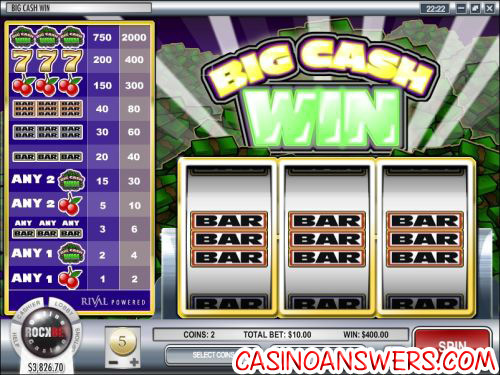 Big Cash Win is a 3-reel, 1-line classic slot machine developed by Rival Gaming. You can play the Big Cash Win classic slot at Bovada. Big Cash Win’s theme is simple – cash! The graphic in the background of the Big Cash Win classic slot machine is consists of mounds upon mounds of cash. Symbols in Big Cash Win are: Big Cash Win logo, Cherry, three Bar symbols and 7’s. In all, there are 11 unique winning combinations. To play the Big Cash Win slot machine, set your coin value. Coin values start at $0.01, followed by $0.05, $0.10, $0.25, $0.50, $1, $2 and $5. Next, choose whether you want to bet one or two coins. Casino Answers recommends you play the maximum 2-coin bet due to the increased value involved. The minimum bet on the Big Cash Win classic slot is $0.01 and the maximum bet is $10 per spin. Once you’re ready to play Big Cash Win, you can hit the “Spin” button or use “Bet Max” to play 2-coins and automatically spin the reels. The top jackpot on Big Cash Win is the Big Cash Win logo symbol. 3 of these on the single center payline and you will win 2000 coins! The next highest jackpot is the 7 symbol at a much lower 400 coins. Payouts on the Big Cash Win classic slot machine are as follows (1/2 coin payouts in parenthesis): any 1 Cherry symbol (1/2), any 1 Big Cash Win symbol (2/4), any 3 Bar symbols (3/6), any 2 Cherry symbols (5/10), any 2 Big Cash Win symbols (15/30), 3 Single Bar symbols (20/40), 3 Double Bar symbols (30/60), 3 Triple Bar symbols (40/80), 3 Cherry symbols (150/300), 3 7 symbols (200/400), 3 Big Cash Win symbols (750/2000). For players who do not like to do a lot of clicking or perhaps like to multi-task while playing at their favourite online casino, Big Cash Win has an autoplay feature available for real money players. If you’d like to try Big Cash Win out along with a whole bunch of other great classic slot games, please check out Bovada! Are US players allowed to play the Big Cash Win slot machine? Is there an instant play version of Big Cash Win available? Yes, Slots Jackpot Casino offers an instant play version of their casino using Flash. If you encounter any problems with the Big Cash Win Flash game, make sure you have the latest version of Adobe Flash Player installed on your computer. How much can I win playing the Big Cash Win slot machine? On the maximum coin size of $5 while playing the maximum two-coin bet, if you get three Big Cash Win symbols on the center payline, you will win $10,000!